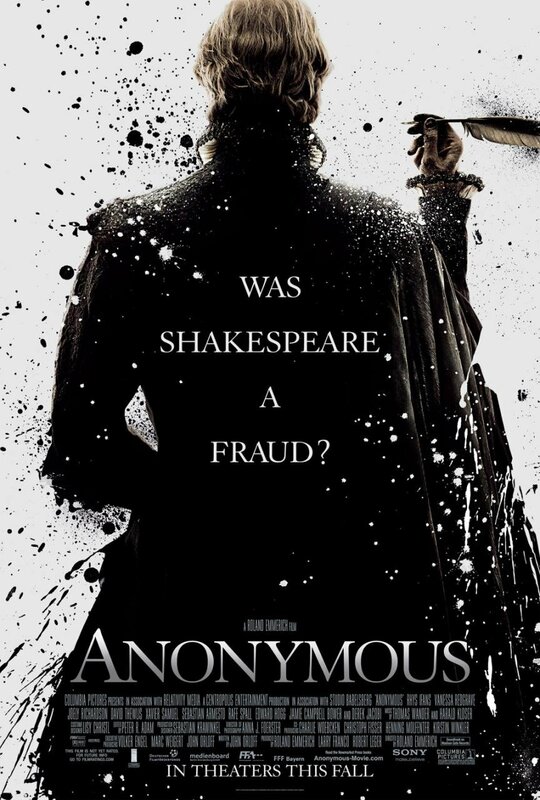 ‘To be, or not to be, that is the question’… ‘Anonymous’ is a film set in the Elizabethan era, and revolves around the idea that Shakespeare may not be the one who wrote his plays and poems. The theory here is that Shakespearean plays were written by the 17th Earl of Oxford, Edward de Vere, and the passed on to an intermediary by the name of Benjamin Johnson, who, in turn, then passed them on to Shakespeare. The latter then staged the plays, taking full credit for each of them. The film, directed by Roland Emmerich and written by John Orloff, depicts quite beautifully the Shakespearian times. It puts an emphasis on the politics of play-writing at that time, incorporating Queen Elizabeth’s younger memories, and similarly to nearly all other films of this genre, involves the idea of a royal family feud over a legitimate heir to the throne. The movie cast is, unsurprisingly, predominantly British with Rhys Ifans (‘Harry Potter and the Deathly Hallows, Part I’ (2010)) in the role of Earl of Oxford; Vanessa Redgrave (‘Atonement ’(2007)) taking part of Queen Elizabeth; Rafe Spall (‘One Day’ (2011)) playing Shakespeare; and Jamie Campbell Bower (‘Sweeney Todd’ (2007)) as young Earl of Oxford, among others. All actors here are convincing, especially Redgrave, whose Queen Elizabeth is probably a fair match to Judi Dench’s Queen Elizabeth in ‘Shakespeare in Love’ (1998). For those who have already got excited they should probably hold their horses as the movie’s overall standard is a far cry from the likes of ‘Elizabeth’ (1998) or ‘Shakespeare in Love’. Although the acting is very good, the film is actually one which is difficult to follow due to its muddy and confusing narrative. The problem is worsened by the fact that the film often leaps through the years and, especially at the beginning, it is hard to identify the characters as there are so many of them presented. Another problem is that ‘Anonymous’ is overly long as it desperately tries to incorporate everything possibility under the sun. In that way, one inevitably has this feeling that there are at least three different stories running in parallel. For the movie-makers, it would have made greater sense to focus primarily on the relationship between William Shakespeare, Earl of Oxford and Benjamin Johnson, and leave other sub-plots to be developed by other films in time. While the audience is fully aware that ‘Anonymous’ is a work of fiction and bound to have historical inaccuracies, they can still be very dumbfounded by the theory which the film pushes forward. The movie is not very convincing in that regard, and the hypothesis itself is not very plausible, lacking any realistic undertones or context. The idea that Earl of Oxford wrote all Shakespearian plays is an interesting one, but, it is also silly at best. What may be shocking here is not an attack by the film on the greatness of Shakespeare as an English poet, but an attack on Shakespeare as a person. While there can be evidence that Shakespeare did not write a word of his own, e.g., some say he was just an illiterate actor, surely there must be insufficient evidence to say for certain that Shakespeare was also vain, frivolous, self-centred and arrogant. However, this is exactly how William Shakespeare is portrayed in this film. This false image of Shakespeare could have been avoided in the movie entirely. Overall, despite its hectic and confusing plot, ‘Anonymous’ could be considered a better movie than many others in the same genre, such as ‘Dorian Gray’ (2009), and, indeed, ‘Anonymous‘ was also screened with some modest success at both the BFI London Film Festival 2011 and at the Toronto Film Festival 2011. Perhaps, it may be best compared to ‘The Duchess’ (2008), whose fancy costumes, decorations and grand settings saved the day for that movie in the end. Pros: An interesting, brave and original idea proposed by the film; beautiful settings and designs; and good acting. Cons: A very confusing narrative; a badly-written plot; and incomplete, “under-developed” characters.